Clinton County Habitat for Humanity desperately needs volunteers. This summer the group has taken a big leap of faith and is building two homes in Wilmington. There is a small group of dedicated and skilled volunteers, but extra hands, inexperienced or skilled, are required. Some community minded businesses like Alkermes, and also, the juvenile community service group have jumped in, but many more volunteer groups are needed to finish the homes by October. 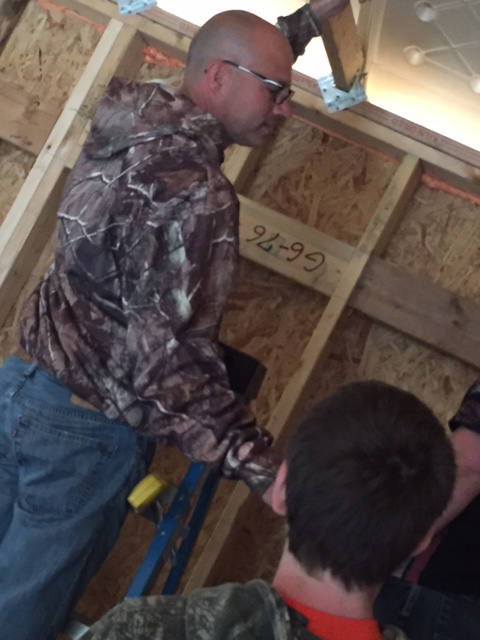 Earlier this spring, Clinton County Judge Chad Carey suggested to his Community Service Coordinator, Chad Mason, to check with Habitat for Humanity for possible work/service projects. “That call from Chad Mason was the answer to a prayer—we know building two homes is the right thing to do, but we really had no idea how we would get two homes built when there are only enough volunteers to build one,” admitted Jim Krusling, President of the Clinton County Habitat for Humanity. It’s up to Mason to find productive ways for young people who must serve their court community hours. They have become an active part of the Wednesday work schedule and were wiring the house along with Mason and site manager Tom Matrka last week. The teen crew agreed that they were learning from their Habitat mentors. Carey is a friend of Habitat and proponent of a community transferring practical skills to the younger generation. Whenever he can help a local group meet their goals, there is an extra benefit. “We have been happy with our crew and this summer will be a good one for the Community Service group as they will see how a house is built.” said Mason. The two building sites are located on Paris Avenue and on the corner of Howard and Vine Streets. Even with the crew from the courts, Habitat will need more support. They are urging businesses, churches and local organizations to lend a hand for two local deserving families. “We need you now,” said Krusling. Are you the leader of a business, church or organization? Could you dedicate one Saturday, Tuesday night or Wednesday? Call the Habitat office at 937-655-9484 for more information.